Tramadol is a powerful painkiller often prescribed for patients who do not find comfort in paracetamol or other painkillers. It works by affecting chemicals in the brain and nervous system give the sensation of pain. 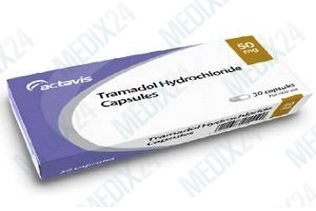 Tramadol is prescribed for pain caused by for instance arthrosis or nerve pain. This product is not available for UK residents. The product is shipped through a pharmacy in Germany. Tramadol works by blocking the brain’s pain signal. The sensation of pain will decrease and you will become calmer. It takes a tablet of Tramadol about an hour to become fully active in the body and decrease the pain. The tramadol will remain active in the body for 6-8 hours. How do I use Tramadol? Can I use Tramadol in combination with other drugs that I am currently taking? When you order Tramadol from Medix24, we will ask you to fill out an extensive medical questionnaire on which you will also have to list any other medications your are taking. From that list, our professional EU doctors can judge whether Tramadol is suitable for you. How can I buy Tramadol online? The answers to your medical questions are reviewed by a fully certified physician connected to Medix24. When your doctor approves your request, he will forward your order to one of the pharmacies who work with Medix24.